These European refrigerators by Vestfrost of Denmark (formerly called ConServ) are an important component of any alternative energy, off-grid home, where energy efficiency and conserving electricity are of prime importance. 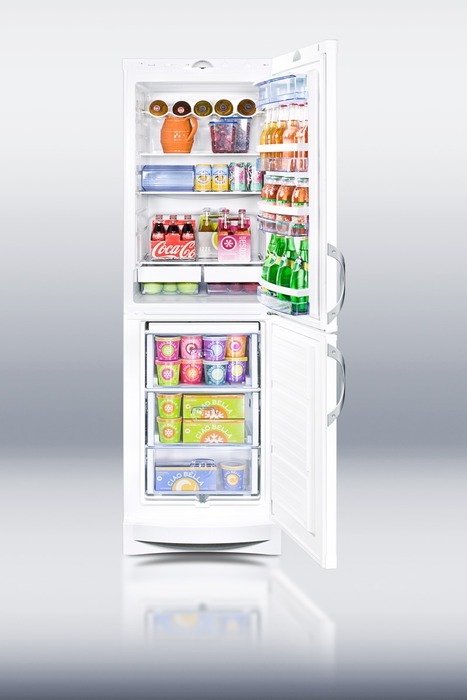 These Vestfrost refrigeration units are available in white only (the stainless steel model has been discontinued as of August 2013) and use one-third to one-sixth the energy of conventional refrigerators. Their sleek design features a 2' x 2' footprint, making them an attractive refrigerator for your home. For the home that is connected to utility power, the Vestfrost refrigerators will help keep a lid on your present utility bill. Tall and slender, these refrigerators will take up less space in your kitchen or small apartment too. If you are interested in a stainless steel model, we offer two options. Please visit our Efficient Refrigerator site for European designed models available in both stainless steel and white. These come in 9.65 cu.ft. and 13.8 cu.ft. sizes and are frost-free as well as Energy Star-rated. Another option is the new Summit Appliance replacement for the Vestfrost unit in stainless steel. While no longer made in Europe, the FBFFCP171 has most of the features of the original Vestfrost as well as the added feature of being frost-free. Click here for features and pricing of this new, energy-efficient refrigerator/freezer. If you are looking for parts, try www.buyspares.com and type in Vestfrost. Why an energy-efficient or propane refrigerator? "Full Site Index" for more information. and more Energy Star listed appliances, please click here. copyright 1998-2011 Oasis Montana Inc.